Is there a single word (similar to Russian свой for those familiar with Russian) which I could put into this sentence? By tomorrow, one of us will see the money in __ account. By tomorrow either you will see the money in your account or I will see the money in my account. One of us will see the money in their account. It's useful for purposes besides referring to someone of unspecified gender. EDIT: Upon further consideration, my modification to Andrew Leach's answer is just as good (and better for people uncomfortable with the singular they in this context). One of us will see the money in our own account. To me, our suggests a joint account, but adding own removes that implication, and suggests a single-owner account. Our own can be used for joint ownership, but only if this is implied by the context. You could use our or his. By tomorrow, one of us will see the money on our account. By tomorrow, one of us will see the money on his account. This is more of a distributive than a reflexive (or reciprocal) pronoun. However, that usually applies each of a plural subject singularly, which together are still many. You want something that picks out just one, and still has grammatical agreement. This is perhaps easier done with rephrasing, but many native speakers will use something involving their or own, or sometimes both. You will not see an exact English equivalent to Russian свой because it has grammatical agreement with the subject of the sentence no matter what the person is. Or at least, that’s what they say here. It looks to me like it can not only match any one of the plural subject, it can match each of them separately. If so, that makes it a distributive pronoun, and English doesn’t really have one of those. We tend to add words like own or even respectively, but that doesn’t work everywhere. By tomorrow, either of us will see money in our own account. By tomorrow, either of you will see money in your own account. By tomorrow, either of them will see money in their own account. No, it isn’t always a perfect solution, but at least and there may be a bit of ambiguity left, but at least that way you don’t have to switch persons for the account. The own lets you use a plural pronoun but apply it singularly to just one of them. I gave both (of them) dollar of their own. He gave each of us our own dollar. That clearly talks about individual ownership. One of us will keep it for our very own. One of us will keep it for that person’s own. One of us will keep it for their own. By tomorrow, either of us will see it in that person’s account. By tomorrow, either of you will see it in that person’s account. By tomorrow, either of them will see it in that person’s account. That seems a bit unnatural to me, though. It is perhaps especially odd to use that sort of thing in the first or second persons. That normally is for something away from the speaker, and you just can’t say *in this person’s account for talking about oneself. By tomorrow the money will be credited either to your account or to mine. Either way, one of us will see it on the other’s account. Conventionally, his, her, or its is used to refer to one where it means one instance of something (as opposed to impersonal one, where the possessive is one's). See Fowler's Modern English Usage on "One" below. Use her if both of us are female. Not the answer you're looking for? Browse other questions tagged single-word-requests pronouns translation or ask your own question. 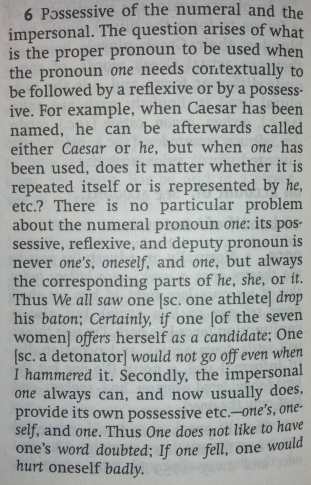 Is it typical native speaker usage to inconsistently use the pronoun “one” in a paragraph? A non-insulting version of slant-eyed? What is the English term for “assume the least dangerous body pose when falling”?